Cessna 400 Demo Ride | Tennessee Aircraft Services, Inc. Working on planes is a great job but flying them is the real kicker. I hope you will all excuse me for this departure from my typical tech article. After flying the Cessna 400 at Airventure this year, I felt compelled to share the experience. I’ve flown a lot of different piston engine aircraft and always associate aircraft size, engine horse power and/or system complexity with the term “high performance”. 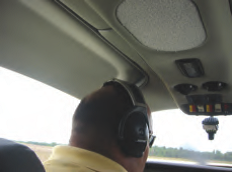 Flying the Cessna 400 gives an entirely new dimension to the term. I don’t get to fly aerobatic aircraft so to fly a plane that does what you tell it and no more or no less is an amazing treat. I believe a fair statistical comparison can be made between the Cessna 400 and the Cirrus SR-22 G3 using their published specifications because the certification process for these new aircraft require realistic performance data. This published data for the two brand “C” airplanes shows them to be very comparable, but be sure you compare using a Cirrus SR-22 G3 with every option because that’s how all of the 400s are sold. A few months ago, I spent a good bit of time at the factory in the week long maintenance class and became very familiar with the plane. However, looking at one you’re about to fly gives a very different perspective. Clean lines, smooth curves, no rivet heads, leather seats, racy paint scheme, no cowling screws, and gull wing doors all work together to draw you in. I could feel that same silly grin coming on I used to get as a 6 year old sitting in pilot seat of the old 195. As a semi-adult, I refrained from making engine sounds in front of the factory demo pilot. The preflight is very straight forward. Interesting to note that all the flight controls have three hinge points and the trim tabs have two actuating rods. All part of the very stringent FAR part 23 Utility category certifi cation requirements. Getting in is a little different for the typical single engine Cessna driver; one hand here the other hand there one foot onto the floor (not the seat cushion) the other foot in and gently slide right into leather comfort. Everything feels strong; cabin doors are thick and rigid, the door latch is easy to engage and secure, seat latching mechanism is positive, and minimal flexing in the seat back. The doors are hinged on top so opening in flight is an absolute don’t do. When the door is closed you must be sure the latch pins are retracted so they don’t hit the inflatable door seal. The door easily pulls all the way closed because the door seal is deflated. Once seated and buckled in with the door latched (no slamming), your left arm finds the arm rest and your hand wraps naturally around the control yoke. The 19 degree yoke angle for ailerons neutral is exactly where you think it should be. Two people up front are very comfortable in the 50 inch wide cabin. My 6’3” tall 300 pound friend was very comfortable in the back seat. Later, we swapped places and he took a turn in the front seat with plenty of space even with the Bose headset on. There is sufficient leg room in the back seats but foot space is somewhat hampered by the wing spar, similar to a Bonanza. Nice size baggage area and easily accessible from the back seats. 6’3” & 300 lbs (not me) and plenty of head room. Battery masters, alternators, avionics master, and buss cross tie switches are located in the overhead panel. The left electrical system is completely independent from the right and either can power the entire aircraft via the cross tie if needed. The #1 alternator is gear driven on the right front of the engine (standard TCM) and is rated for 65 amps. The #2 is belt driven on the left front (more like a Lycoming) and rated for 52 amps. 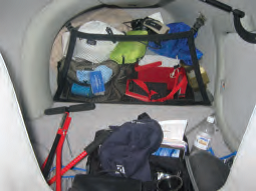 The ship’s two batteries are identical and mounted under the hat rack in the aft baggage compartment. The Cessna 350 mounts both batteries in the firewall. Engine start is fairly standard for big bore TCM, especially if you are accustomed to Cessna turbo twins. One new item is the vapor suppress switch which is turned on before the start and can remain on throughout the climb. The vapor suppress switch is also used for high altitude vapor suppression. While the starter is engaged, a primer button next to the ignition switch may be pressed to give an extra shot of fuel. Initial cockpit startup includes air conditioner. There have been a couple of different renditions for climate control on the 300/350/400 series over the years and all have had their share of problems. The current system seems to be doing well and is certainly easy to use. Very “automotive like” and a welcome feature on this 90 degree day. The fresh air ventilation and air-conditioning systems use totally independent vents. More importantly, someone finally realized air conditioning compressors use minimal horse power, so you can take off and land with the a/c on. A new feature for the G1000 is the remote keypad, or Ready Pad, located in the center console just forward of the fuel selector. 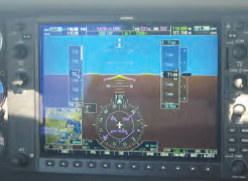 Everything on the G1000 can be controlled from this panel, including the autopilot. Entering alphanumeric data without having to scroll through the alphabet is really nice. You can also move the highlight and activate soft keys without reaching across the panel or looking down at the pad. With no positive nose gear steering, the rudder pedals move freely on the ground. Taxi with differential braking is not quite like a 180/185. 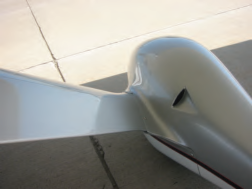 The tail wheeled 180/185 has over 230 inches from the main gear to the tail wheel and the mass of the engine is very close to the pivot point of the turn. On the 400, there is only about 80 inches from mains to the free castering nose and the mass of the engine is past the 80 inches. Combine the inertia of the engine with the gear configuration and you can see a little fore thought is required for taxi. It’s no problem but does require a couple of turns to get used to. Tension definitely was building for the take off: no worries with the plane, I just didn’t want to do anything stupid in front of the factory pilot. Turning in the vernier throttle spooled the turbos and gave wonderful acceleration down the runway. Rotate at 70 kts and initial climb at 100 kts for 1500 fpm climb. We cruise climbed at 120 kts with about 1000 fpm. Visibility over the nose was very good in the climb and through out the flight. In my previous life as an avionics guy, I installed, maintained, and flew all the certified general aviation autopilots. I always enjoyed auto pilot work because it interfaced with almost every system in the plane creating a more interesting challenge. This Garmin GFC-700 autopilot came well after my time as an avionics tech, and it’s a far cry from any of the older systems. For the sake of demonstration, I relinquished the yoke to the GFC-700 in the airspeed mode for climb to a preselected altitude of 7500’. If I hadn’t been watching I wouldn’t have known we leveled off. Turns-to-a-heading and nav-tracking are just as smooth and precise. The near seamless integration between autopilot, navigation, flight instrumentation, and flight controls is impressive. There is no flight adjustable rudder trim but there is a rudder hold. You just put the rudder peddle where you want it, press the button, and it stays there. Enough ego-deflating, autopilot upstaging, and I’m back to hand flying. As with most small planes it is best to fly with ones finger tips. Holding the yoke with closed fist on the 400 for pitch change requires movement of the forearm which makes your elbow bump the seat back. At cruise speeds it only takes a little finger pressure to get the results desired. 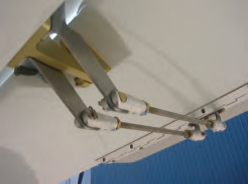 The aileron and elevator trim is operated via a joy stick style switch at the top of the yoke and adjusts at comfortable rates. Dual links on the elevator trim tab. Difficult to see but – 190 kts true airspeed. 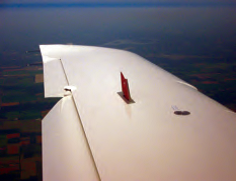 During slow flight and stalls, the airplane required obvious increased deflection of the controls but was very responsive, even crisp feeling. The stall happened exactly at 60 kts just like the G1000 airspeed ribbon indicated. There was plenty of warning from the airframe and the plane dropped off straight ahead. We also noted that good aileron control remained well into the stall. The 400 has a much larger rudder than the 350 for high altitude spin recovery. At 7500’ that translates into plenty of rudder control. A slight lead with rudder into and out of a turn puts it spot on. During descent into slightly rougher air, I noticed how rigid the wings were. No obvious flexing of the wing, which made for a little stiffer ride than, say a 210. We entered the pattern at 100 kts with one notch of flap then slowed to 80 kts on final with full flaps. The plane flies very nicely at 80 kts, so mingling with slower traffic is no problem. Speed brakes also offer great help as they can be deployed and retracted at any speed. The final approach attitude suggested by the demo pilot reminded me a lot of a 340 or a 414; fairly steep with a nose down feeling pointing at the numbers and just a leveling off at the runway instead of a ‘true to life’ flare. We did one landing with a more typical fl aring approach which worked well also. Touch and goes were smooth and transitions easily with very spry acceleration. Cooling vent for tightly faired brakes. Overall, I obviously liked the plane. It’s certainly not your typical single engine Cessna. A simple comparison would liken the venerable 210 to a cross over SUV and the 400 to a sports sedan. Every performance gain requires some compromise and this new breed of high performance fixed gear four place plane is giving up cabin payload. With the three of us in the plane and about ½ fuel there was still real-estate in the payload chart but not much. That said, much of the payload loss is in the form of a complete second electrical system, air conditioning, redundant fl ight control hinges and actuator linkages, and over the top airframe structure. So, what you all want to know is how much effort will it take to transition from your beloved metal Cessna into the “new” 350 or 400? I would list the most likely hurtles by order of diffi culty from hardest to easiest like this; G1000 and autopilot familiarization, cockpit layout, general differences in control inputs, and air conditioner operation. 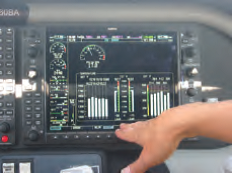 If you are already a G1000 user, then mark that off and move the autopilot to the end of the list. I listed the air conditioner only because you have to get used to having it on whenever you want it.